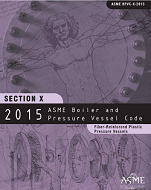 BPVC-X-2015 provides requirements for construction of an FRP pressure vessel in conformance with a manufacturer's design report. It includes production, processing, fabrication, inspection and testing methods required for the vessel. Section X includes two Classes of vessel design; Class 1 a qualification through the destructive test of a prototype and Class II,mandatory design rules and acceptance testing by nondestructive methods. These vessels are not permitted to store, handle or process lethal fluids. Vessels fabrication is limited to the following processes: bag-molding, centrifugal casting and filament-winding and contact molding. General specifications for the glass and resin materials and minimum physical properties for the composite materials are given.